My first visit on Day 2 was to Masque Fragranze Milano founded by Alessandro Brun and Riccardo Tedeschi. I met with cofounder Alessandro Brun who spent time taking me through the range and talking through the ideas behind the creation of their perfume house. Interestingly the two creative directors met at Politecnico di Milan where Alessandro is an Associate Professor. Riccardo Tedeschi was a talented student who continually asked questions in class and the two struck up a friendship. With similar artistic and musical interests and a fascination with luxury brands, they eventually decided to work together. Alessandro and Riccardo carefully select the perfumers they work with and tend to pick lesser known names. Their selection process involves examination of the perfumers’ previous work and the raw materials the perfumer prefers to work with. Masque aim to create a collection of perfumes that inspire different moods, just as actors wear masks in an opera to signify changes in scene and character. In fact, the bottles are labeled as Acts and Scenes from an opera and the caps on the bottles bear the perfumer’s name. There are currently five perfumes in the Masque collection : Act I Scene one – Terralba : Act I Scene two – Montecristo : Act II Scene one – Luci Ed Ombre : Act III Scene one – Tango : Act I Scene three – Russian Tea. Overall it’s a range with stories and attention to detail that create a memorable experience for the perfume lover. I smelt each of their perfumes with Alessandro, and they have a fantastic capsule collection of scents. Stand outs were Russian Tea, Tango and Montecristo. My absolute favourite from the line is Tango from perfumer Cécile Zarokian. It’s a lush, swirling hot, sticky perfume. The jasmine is gorgeous and it’s a full-blooded floriental that’s coloured very dark in the bottle. I adore every part of this scent. I was also interested in the travel chest that displayed their collection at Esxence. Hand crafted in Italy, it is reminiscent of the large luggage chests that were in vogue when travel became popular in Europe for the aristocracy and the well-heeled. Next up was Stéphane Humbert Lucas 777 and after smelling his scented wares, I’m pretty much in love with his perfume range. His creations have a Middle Eastern sensibility and are beautiful, richly textured and imbued with warmth. He had a large stand at Esxence right near the entrance that attracted my attention almost at once. 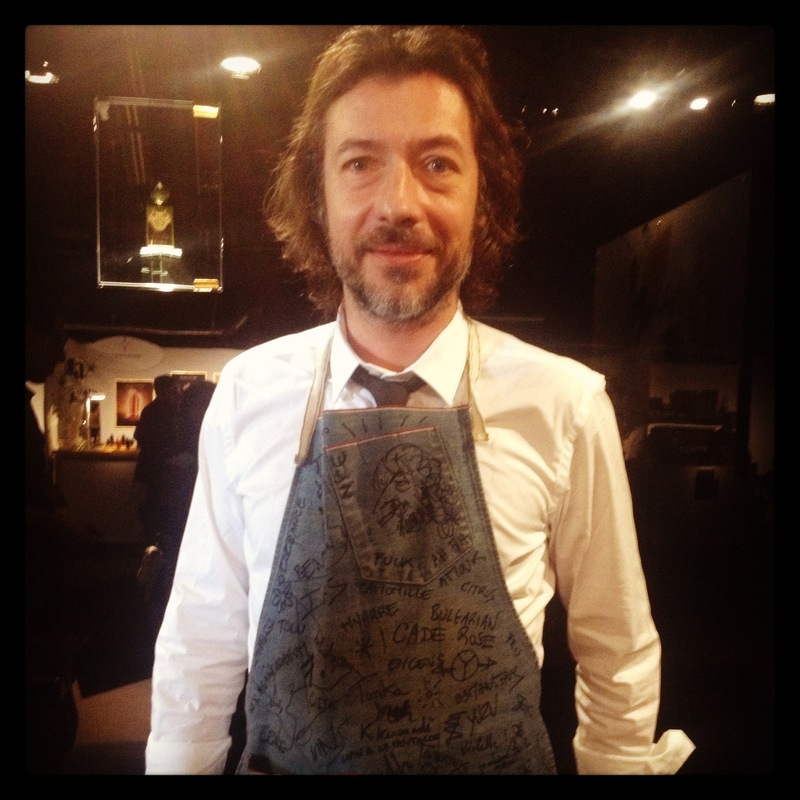 When I visited, he was wearing an apron he’d written over the night before, and for some reason he seemed to me a little Serge Gainsbourgesque with that mix of creativity and Frenchness. When I told him this, luckily it didn’t seem to cause offence and he said he adored his music. Stéphane admitted that he is a lover of smells more than perfumes. He talked of the historical importance of smells and the evolution of perfumes over time. Interestingly he felt that perfumes today are more subdued as IFRA (International Fragrance Association) is pushing the industry to create pastel shades of smell. With his new creation the gorgeous Mortal Skin, Stéphane was looking to create a perfume that would appeal across European, Russian and Arabic cultures. He said he wanted a vertical knock out punch that would really make an impact. He was inspired by the snake, by its beauty and the feelings of attraction and repulsion we have towards it, often simultaneously. In Arabic, apparently the number 7 is a lucky one, representing god, and Stephane liked the design of the three 7’s together for the name of his perfume house. 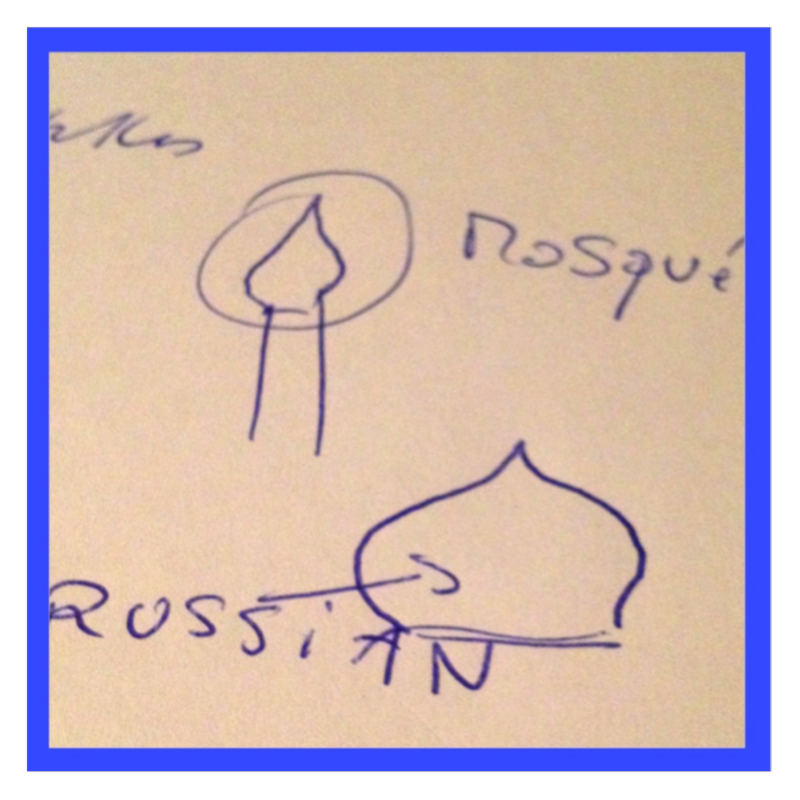 He drew a quick sketch to illustrate how he conceptualised his bottles to incorporate the mosque and the Russian onion dome. The best seller in the line is Soleil de Jeddeh, although I was immediately smitten by Khol de Bahrein, a sumptuous blend of violet, iris and amber. If you’re an iris lover you must give this a try. It’s simply stunning. Onwards to Pierre Guillaume, one of my favourite perfumers. Hello L’Ombre Fauve, Musc Maori, Cuir d’Iris, Tubereuse Couture, Cuir Venenum, Indochine ad infinitum …. He has just released the Croisière Collection, a line of aquatics. This is a genre that took off in the 1990’s with the introduction of calone, an aroma chemical that provides a marine like smell. Popular scents that were awash with calone in the 1990’s were L’Eau d’Issey and Cool Water. You couldn’t escape those perfumes back then. Due to its over exposure in perfume, this style has had a bad reputation especially in the niche perfume world for quite some time now. This is about to change as at Esxence there seemed to be a tidal wave of marine scents. Pierre is the one to take the lead here though with a whole collection based around the theme. There will be eight perfumes in total in the Croisière Collection and four are now available. 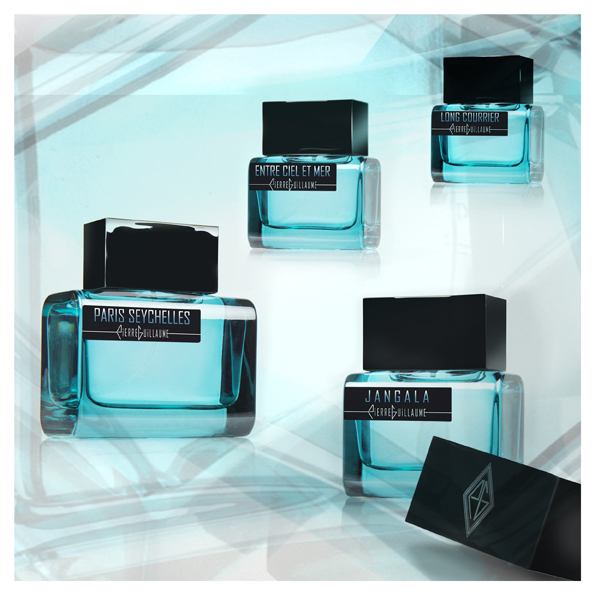 Entre Ciel et Mer, Paris Seychelles, Jangala and Long Courrier are the first editions. (See CaFleureBon for reviews). Mojito Chypre, Metal Hurlant, Foudre and Rivages Noir will follow and arrive on shelves in September. The two I enjoyed the most are riding in on the second wave. Mojito Chypre immediately grabbed my attention with its boozily led name. It’s a sweet strawberry tinged mojito cocktail that he has managed to pull off – no mean feat in itself. This is something that could easily cross straight over to tacky territory but somehow he makes it work. The other was Metal Hurlant a tough leather with a metal accord that crackled with intensity. Talking to Pierre Guillaume, he spoke of the importance of the Russian market for perfumers. France apparently doesn’t have as developed a niche market as Russia or Italy, where the love of non mainstream scents is very strong. 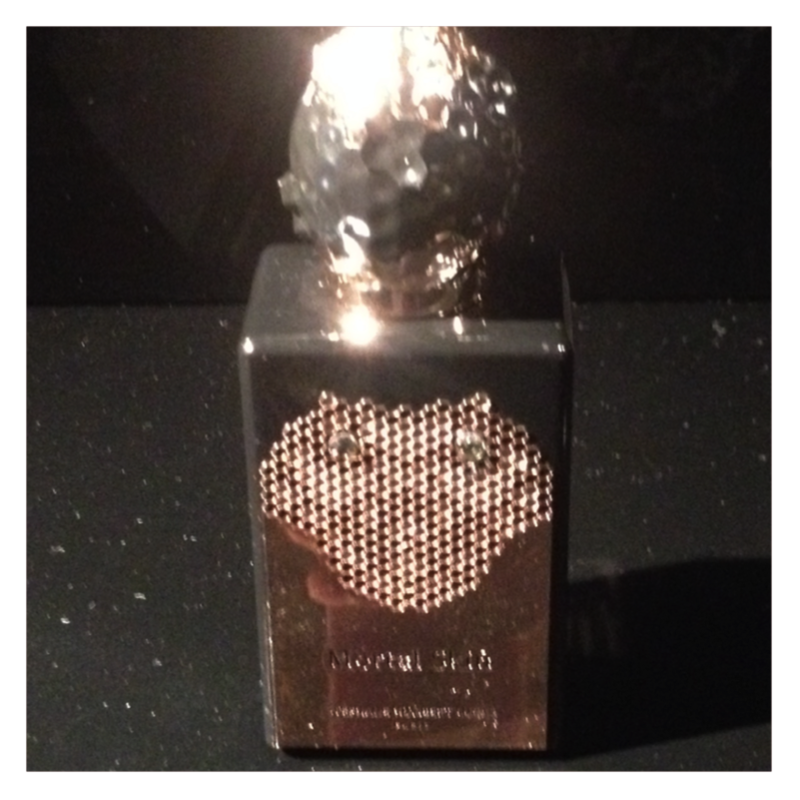 I told him one of my favourites from his line was Tubereuse Couture, a scent that is rarely mentioned in the blogsphere. He said that it was actually one of his best sellers in Russia, they absolutely love it there. There’s still more to come …. What a great round-up of day 2 at Esxence. Thanks Lucas. It all went by so quickly but it’s quite nice remembering what we smelt and saw. I’m trying the new one from Gabriella Chieffo tonight – Aquasala. Have you smelt it? Also ditto re Khol de Bahrein! Ps. would you like me to make a blog logo for you? It must have been a fabulous journey of discovery for you. Wonderful to meet the creators! Yes it was very inspiring and interesting to see the perfumers and creative directors speak about their creations.